Note: I am no longer managing this place (instead focusing on private custom boat tours through the area – best way to get here) so if you’d like to stay here please communicate directly with the new manager either by email at Arnold Cabiguen <[email protected]>, or facebook, or by phone at +639989834011. Mostly only the big hut is available, but it may be possible to rent some of my tents or bring your own. There is tons of space. 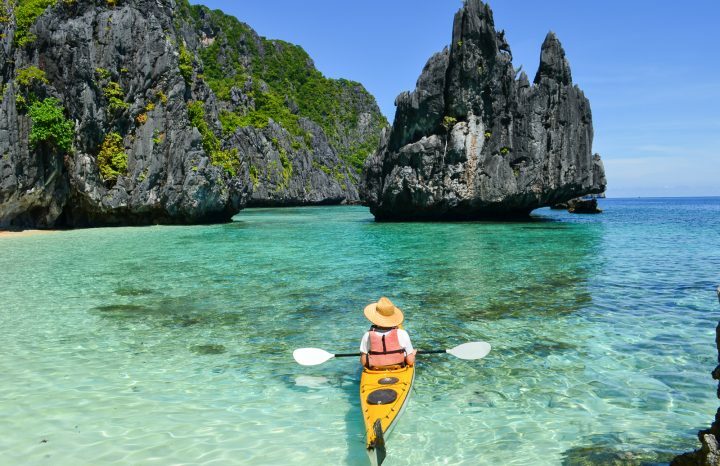 We are located on a beautiful island near to Linapacan, the half way stop between El Nido and Coron and where you will find the clearest waters in the world. 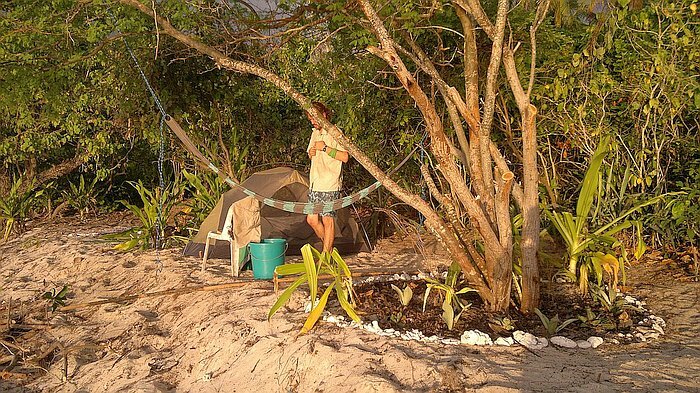 Stay in a tent right by the shore or pocket of private space carved into the jungle, or our big hut with own solar power. Check out our Pros and Cons to see if this is the right place for you, or the top of our accommodation page to choose the perfect spot for you. Number of boards is limited so * per day rates assume sharing with others, 1000p per person. No instructors at the moment. If you bring your own board (hard to get around here), we’d be happy to buy it off you and you can surf for free during your entire stay. Excellent snorkeling just off shore and on neighbouring islands you can swim or kayak to (occasional big turtle too!). 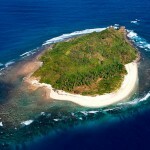 And caves to explore, 2 shipwrecks for diving, and a thousand, undeveloped beach paradise islands to discover. 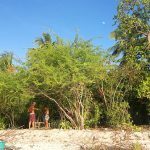 Blend in with a rural community away from the tourist hustle, fishing excursions for only 300p, a quiet retreat and far earshot from even the usual rooster calls often found in such remote locations. 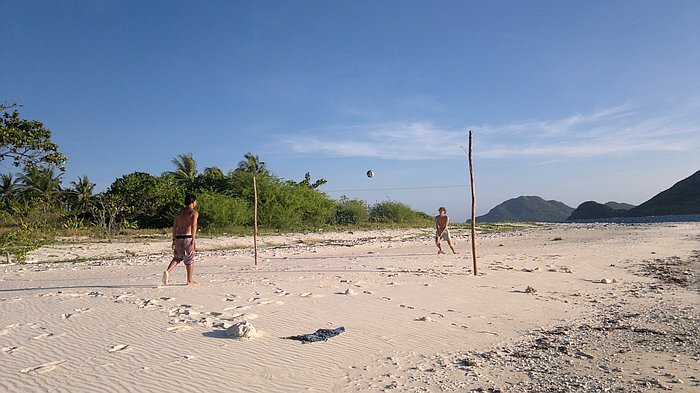 Discover the magic of Palawan and experience rural life among warm-hearted Filipinos. Evening entertainment includes live music around the campfire by ocean side. 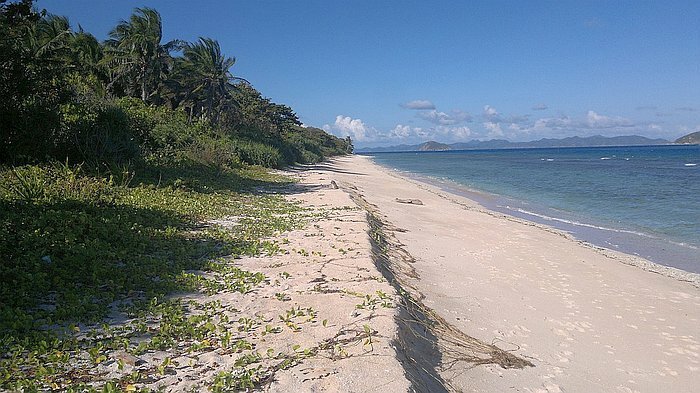 Our beach on the west side of the new island, sheltered from the winds of the open ocean facing side. Good for beginners to intermediates. Advance kitesurfers can either trek for 10min to the other side, or launch from the end of this beach at the southern end of the island and work their way against the wind. Inevitably, one of the first things we had to set up. 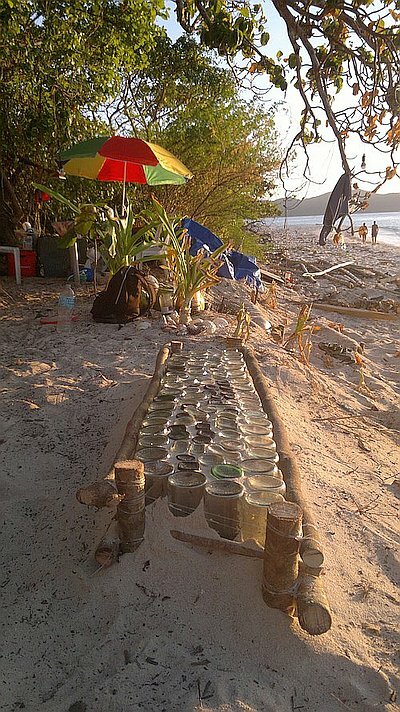 Made seaside table from bottles we collected off the beach. Natural and eco is the name of the game! Lots to explore on the island. Sunrise facing the open ocean (more sunrises and sunsets). Go to the top left (latest) album in our photos section to see our most recent developments. We are located in the lower left corner of Dimancal island, about half way along the long stretch of beach on the lower west side. 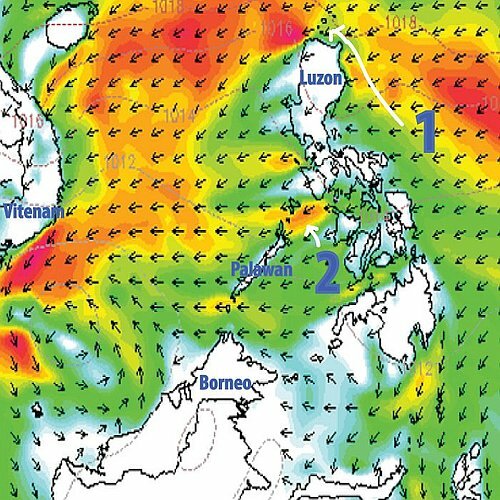 From May until October the Habagat trade winds blow from the southwest. They are rather sporadic and unpredictable, but can produce strong winds. 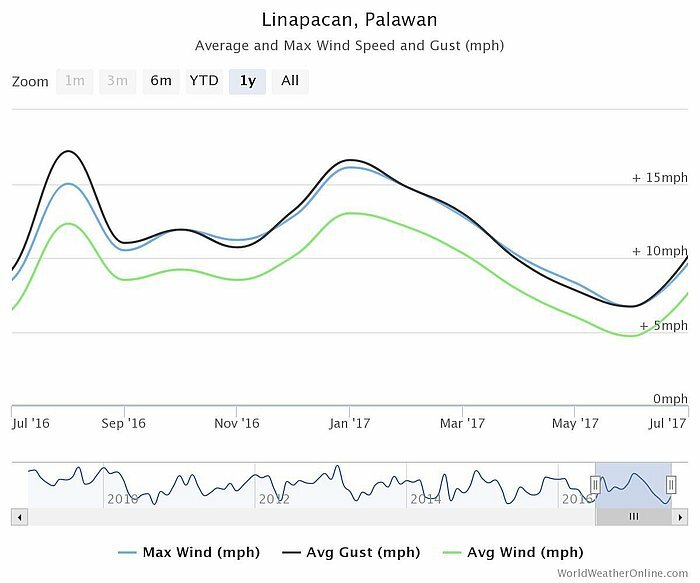 From November until April the Amihan trade winds blow from the northeast but are much more consistent and stronger. 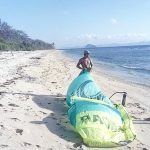 They flow around the island to produce onshore winds on the west side but which are generally subdued and ideal for beginners and intermediates. 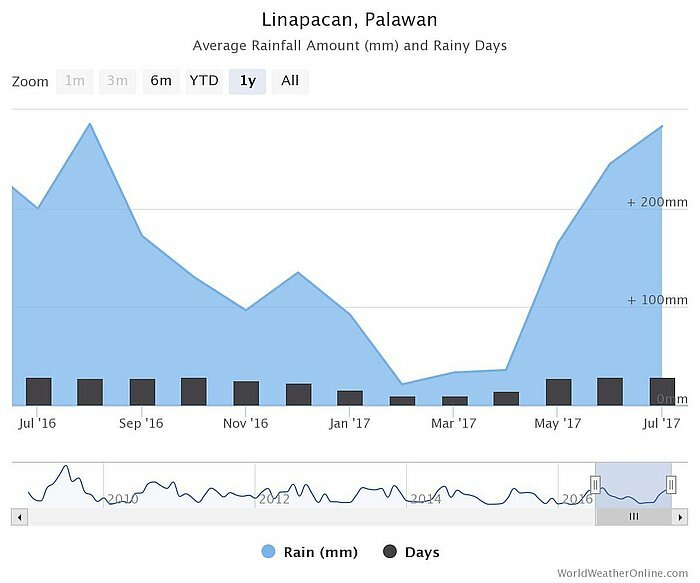 This is generally the best time of year to come, as it is the tourist high season, it almost never rains and there are no bugs. Many of our guests sleep on the beach under the clear stars. The above graph is for Linapacan, the big island about 30 minutes by boat south of us. It has much higher mountains and often catches the clouds and rain while it remains sunny on our little island. 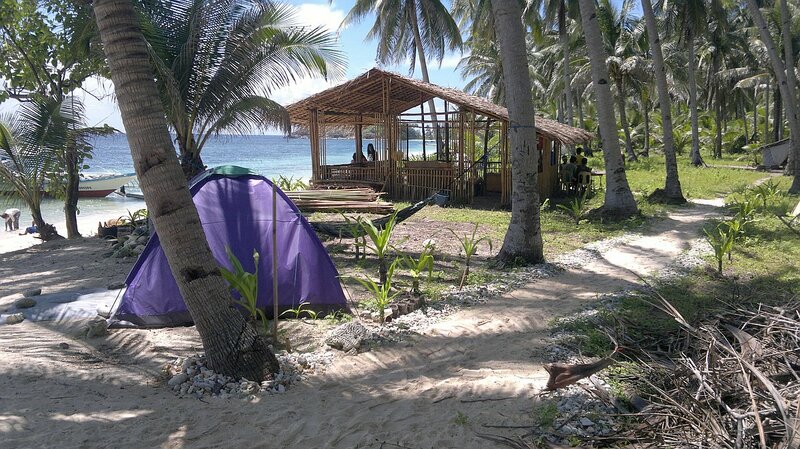 During Amihan, one can launch from the southern tip of the island, a five minute stroll from our resort, and work against the wind to surf on the windier, east side of the island. 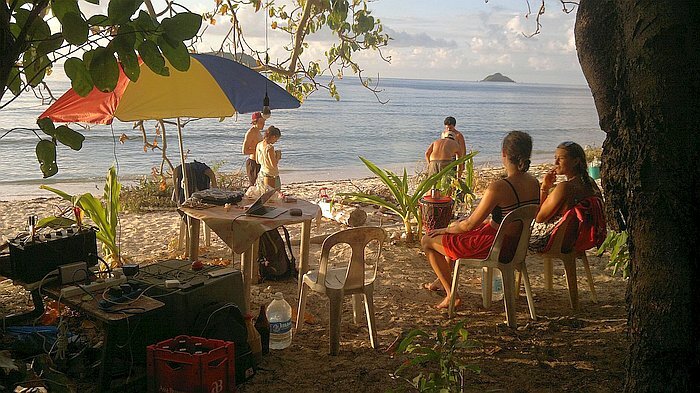 The small island to the east of us has a cool beach where you can rest in the shelter. 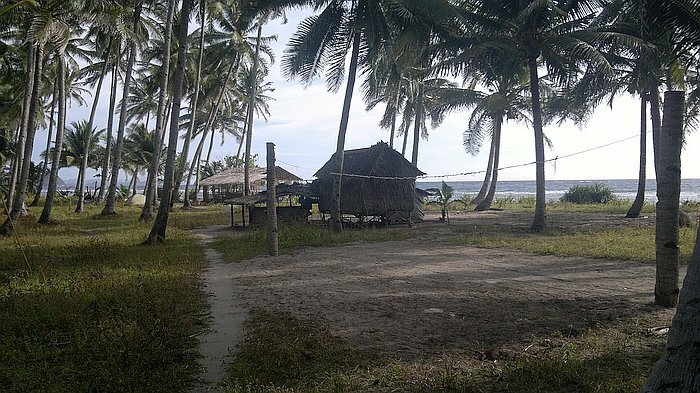 Patoyo Island is just south of Dimancal (where we are located now) and where we first set up before having to move because the wind was so strong and the waves too large for a boat to land on the east side of the island, where we were located. Guests are welcome to stay on that island as well (next two pictures). here shown before the last string disappeared. 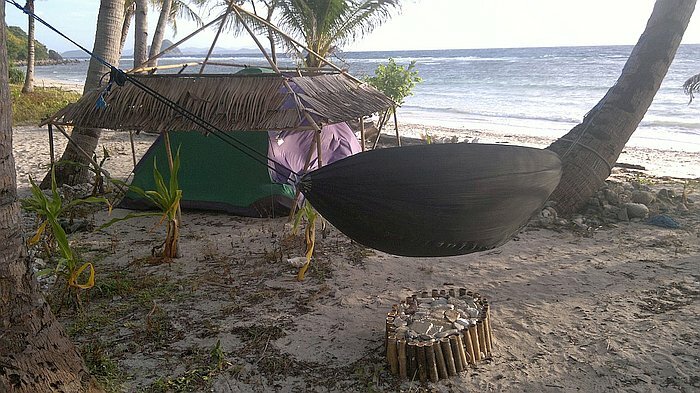 Below, at least our hammock managed to get in some kitesurfing. Tried to shelter my tent but that eventually ripped apart too. 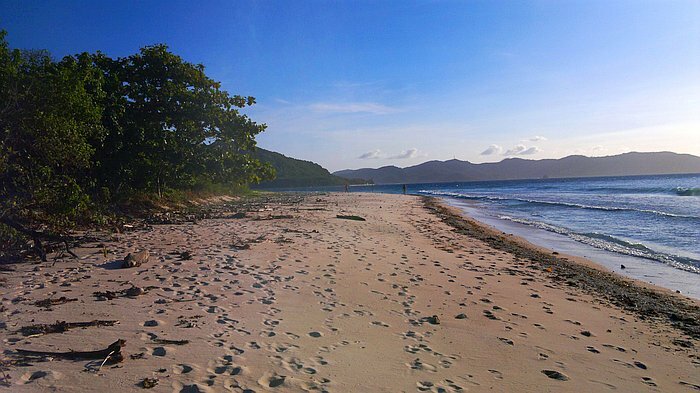 Long stretch of lonely beach on the east side of Dimancal island, facing the open ocean. Only a few scattered fishermen family huts here. 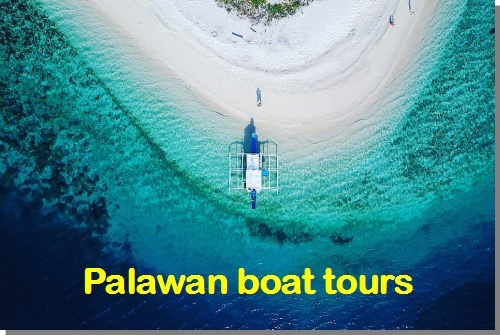 Best way to get here is by private custom Palawan boat tour either from El Nido or Coron. Tons of paradise beach islands between the two, mostly undeveloped, off the beaten path. 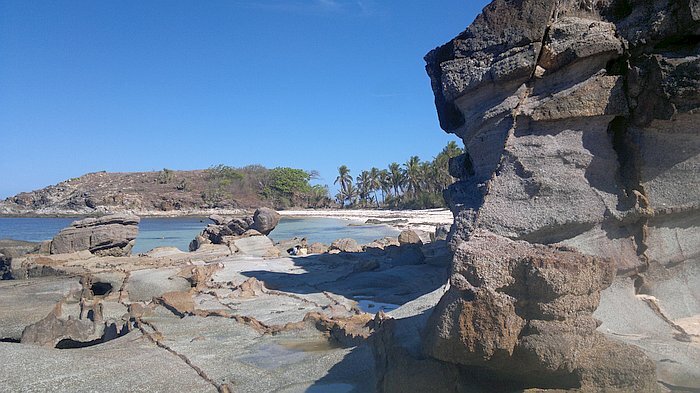 52 islands in the Linapacan area alone, where we are based. Welcome any time! First kitesurf board already on its way, and construction will begin soon on the main hut, to give somewhere to chill out when raining. Would love to come help out building when I’m out that way for a week or 2. I travel with a basic back country setup so it looks like a perfect spot! Give me an e-mail and lets set something up! Right on. You can check out the volunteer program at helpx Would like to learn a bit about you first, so perhaps connect on facebook or something? Mine is here. You can also direct PM me at kenax[AT]kenax.net. Thinking of doing the same with paying guests. Want to create a happy paradise. I have some questions regarding your resort. I will land in coron on the 21.12.2016 and well your place looks like a spot to stay between coron and el nido. 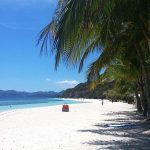 Can you tell me how i get there and how i can travel further to el nido? How long does it take from coron to your place? One last question, do I understand it right, that i cant learn kitesurfing there (as i really want to learn it, but never had time so far)? 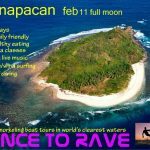 Hi Valentin, I can organise a private boat tour for you if you want to island hop on the way, or you can take the regular banca ferries. From Coron to Linapacan it is about 3 hours by the banca ferry, and then 30-40 minutes from Linapacan to my island. I have a 4.5m kite I can teach you (for beginners), but if you want to kite with the board, you will need the larger kites (12 and 14m), but I cannot train you on those yet. Your place looks amazing, and I am really looking forward to visiting. My girlfriend and I are looking to book a tent from the 12th of April until the 16th of April. I sent an email as well. Can you please get in touch to arrange the booking? We also have some questions about transport/itinerary etc. You can now book to pick out and reserve a spot. 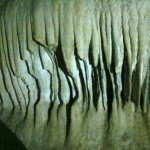 Pics of other places to soon follow. The top of this page should show prices, but I haven’t rented out yet and not sure about them. May be as high as 2,500p per half/full day. You can check out the ferries page for details how to get here, otherwise it might be best to get on a private boat tour if you are short of time. I have tried to message you on FB Messenger but have not received any response. Is there a better way to contact you? Facebook notifications are not reliable and best to always write to me directly through the Contact link at the top right of each page. Hi! I love your Eco camp! I’m looking for a place to learn how to kitesurf from November onwards, but you don’t have any instructors at the moment, correct? Are there places closeby where I could learn? I would also like to know if there are any types of jobs open to tourists in the camp? Hi Zoe, I can train beginners on a 4.5m kite without board but not yet for the bigger kites. 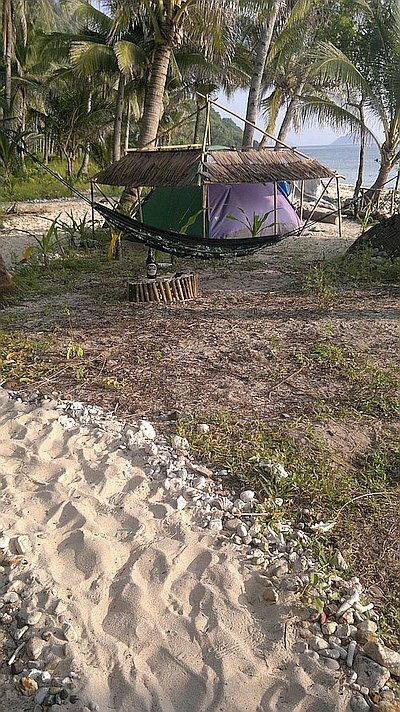 You can check out http://www.islandhoppinginthephilippines.com/palawan/various/kitesurfing-and-kiteboarding-in-palawan/ for other kitesurfing camps in the Palawan area. Sorry, no jobs here at the moment. Hey, I would like to know how to get there from Manila, which is the cheapest way to arrive. Hello, we are Anne and Geert, currently in el Nido and we would like to stay on your island for a couple of days. Ideally from 10 or 11th of January. But we are not sure how to get there. Can you please make some suggestions. And also what is the rate for the ‘rooms’/tents. 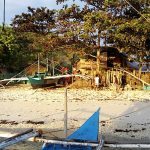 can you tell us more about the castaway project? If you want something only local you can try the new manager of this kitesurfing camp, his contacts on this page, or via a boat tour organized by me.